Our tour guide will pick you up at airport , holding your name board at the exit, then you will be transferred to hotel.The rest of the day is free time. Our first stop in Shanghai is Shanghai Museum, the biggest and probaby the best musuem in Chian. Then take a visit to the Shanghai World Financial Center to have a amazing panorama of Shanghai. Have a pleasant afternoon stroll in the Yuyuan Garden, a typical classical garden in South China. Drop by the Silk Factory to learn about time-hornored Chinese silk culture,and than soak in the Bund to trace Shanghai’s past. Today take a side trip to Suzhou. We are going to appreciate a representative south China Garden-Humble Administrators Garden. Be transferred back to Shanghai after lunch. Be escorted to airport and fly to Yichang; Yichang airport pickup and transfer to Yichang pier to board the cruise. Shore excursion to the impressive Three Gorge Dam Site, the largest water control project in the world. You will be shocked by the turbulent water under your feet. 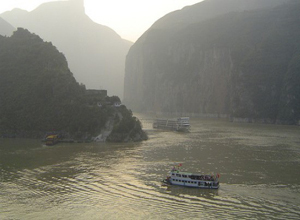 Change a small boat to take a shore excursion to the extremely beautiful Shennong Stream. Shore excursion to Fengdu Ghost City, an interesting place to learn Chinese ghost culture. Local tour guide will pick you up from Chongqing pier and transfer to Panda Room at Chongqing Zoo. Spend the afternoon in the Ciqikou Old Town, known for well-preserved Ming and Qing dynasty buildings. Be transferred to airport and fly to Xian. Xian airport pickup and transfer to hotel. The first Xian tour is of course the most important Terracotta Warriors and Horses. Anyone will be impressed by the underground army. Drop by Xian Art Pottery Factory to buy copies of terracotta warriors. Afternoon roaming in Big Wild Goose Pagoda, a beautiful Buddhist architecture that houses valuable Buddhist relics. The first-rate Shaanxi Provincial Museum gives you a fast knowledge of China history and culture. It is popular to cycle at the top of the ancient City Wall. The Great Mosque is one of the most important islamic sites in China. After lunch fly to the capital of China-Beijing. Beijing airport pickup and transfer to hotel. Today visit the central landmarks-Tiananmen Square, the largest city square in the world and Forbidden City, one of the most worthy to see palaces in the world. Drop by the Pearl Factory before visiting the Temple of Heaven, where Chinese emperors worshiped heaven for good harvest. Visit the spectacular Mutianyu Great Wall by round trip cable car. This section is less crowded than Badaling Great Wall. Drive back downtown and pay an exterior visit to modern Bird’s Nest and Water Cube for photo fun. Spend the fresh morning in the beautiful imperial garden-Summer Palace. Afternoon visit to the old Hutong area to experience Beijing’s past life. You will take an interesting rickshaw trip along the old alleys with lines of old courtyard houses. Free time before airport dropoff. Thank you for using our services. *China internal flights: Shanghai-Yichang, Chongqing-Xian, Xian-Beijing.